Jalpaiguri, West Bengal: PM Narendra Modi during a public meeting in West Bengal's Jalpaiguri on Friday said he shares a special relationship with the people of Bengal - a relationship of tea. During his speech, he attacked Mamata Banerjee-led Trinamool Congress government in the state and said it disrespects the soil of land and has made the people desperate. During his visit, he will lay the foundation stone for the four laning of the Falakata – Salsalabari section of NH -31 D there. The 41.7 km long section of National Highways falls in the Jalpaiguri district in of the state, and will be constructed at a cost of about Rs 1938 Crore. The project will reduce the distance from Salsalabari and Alipurduar to Siliguri by nearly 50 km. PM Modi will also inaugurate New High Court Circuit Bench at Jalpaiguri. 5:27 pm: I want to assure all Muslim women that Triple Talaq law is here to stay, said PM. BJP stands for women rights and whole-heartedly supports justice for women, he added. 5:18 pm: Meanwhile, speaking at another event Chief Minister Mamata Banerjee launched a counter-attack on PM Modi. "I feel ashamed to talk about this person (PM). Nobody from Kolkata HC was present. All infrastructure was paid for by us. The land is ours, circuit bench is of HC but nobody from them was there. It means the bride-bridegroom wasn't there but the band party was there," she said. 5:12 pm: Paschim Bengal ki sarkar ne maati ko badnaam kar diya hai aur maanush ko majboor kar diya hai. (West Bengal's government has disrespected the soil of the land and made people desperate). West Bengal which was known for its art & culture is now being discussed for its violence and undemocratic ways," Modi said. 5:00 pm: "Aaj sthiti ye hai ki Paschim Bengal ki mukhyamantri to Didi hai lekin dadagiri kisi aur ki chal rahi hai. Shaasan TMC ke jagaai aur madhaai chala rahe hain. TMC ki sarkar ke tamaam yojanaon ke naam par bicholiyon-dalalon ke adhikaar hain (Currently, the chief minister of West Bengal is Didi but someone else is running it autocratically. The entire gamut of welfare schemes of TMC is run and owned by middlemen," he said. 4:51 pm: "North Bengal se mera ek khaas rishta bhi hai aur ye rishta aapko bhi maloom hai. Ye rishta chai ka rishta hai. Aap chai ugaane wale hain main chai banane wala hoon (I have a special relationship with the people of North Bengal. You grow tea and I am someone who makes tea)," he said during his speech. 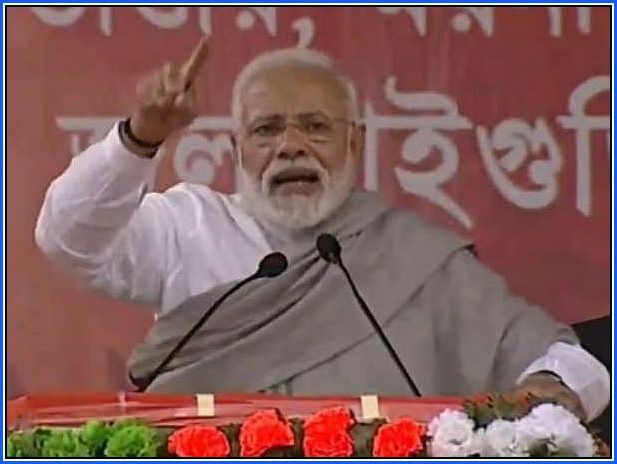 PM Narendra Modi during a public meeting in West Bengal's Jalpaiguri on Friday said he shares a special relationship with the people of Bengal - a relationship of tea.